EVERY footballer’s career has spikes. Few of the sort that caused John McGinn to fear for his future, though. The midfielder’s happiness at joining Hibernian is wrapped up in a hope that the move from St Mirren will bring closure following a horrible few months. 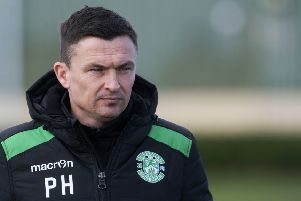 His misery can be traced back to being speared in the leg by a pole that team-mate Stephen Thompson threw at him in jest at the Paisley club’s Ralston training ground. The pole caused a deep gash and tore a muscle. In his shock and horror McGinn, who was always going to decline a new deal with St Mirren as he sought a new environment, freaked out about the potential ramifications of innocent japery that went hideously wrong. “At the time, all I could think about was ‘is my leg going to be okay?’” said McGinn, speaking about the incident for the first time. “Thankfully the doctor was on the scene right away and I’ll be forever grateful to Gerry Canning for being on the spot. The physios and staff were really good. Thankfully it missed the serious muscles in my leg or it could have been a lot worse. “There was a lot of blood, but I can’t really remember much because it happened so quickly. I just remember looking down and I’m glad the pole came back out. I’ll be keeping an eye out for them in the future… it wasn’t ideal. I’m just glad to have moved on and fully recovered. I’m lucky in that it could have been worse. I’ve got a scar but it’s only small. The need to pay a compensation fee for the highly promising McGinn – believed to be around £130,000 – seemed to scare off a number of clubs. That left the midfielder in limbo for much of the summer. He travelled over to train with Owen Coyle’s MLS side Houston Dynamo but a move was not possible because all the club’s international player slots were filled. And in the midst of all this, it emerged that McGinn’s lawyers had lodged a legal claim against St Mirren’s insurers for a workplace injury. “It was a long time waiting around, training myself,” the new Hibs player said. “It wasn’t ideal but I managed to keep myself in good condition. It helped that my brother, Stephen, was in a similar situation [before signing for Wycombe]. So the two of us were just pounding the treadmill and keeping our ears to the ground to see what developed. McGinn is likely to start the Championship opener away to Dumbarton this afternoon on the bench. He might have Scot Allan for company there. The unsettled midfielder is yet to start this season with there seeming no end to the saga over Rangers’ continued attempts to prize him away.